If one were to say that the state food of Goa is fish, and by extension the fish thali, they wouldn’t be wrong. In fact, the fish thali is so popular in Goa, there’s no harm in admitting that it often leads to rather boisterous debates as to which restaurant in Goa serves the best fish thali. 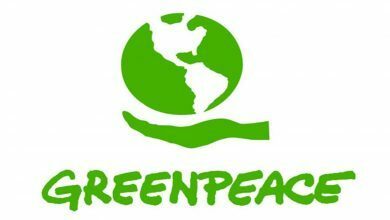 While we ourselves here at ItsGoa have our own preferences, we’re not about to start a war. We concede that between the big-wigs like Ritz Classic, Anandashram, Peep Kitchen, and Copper Leaf, there exist smaller champions in the form of Konkani Coastal, Cafe Ritz, and Anand Bar – so let’s call a spade a spade, and move on. Today, we’re revealing the 5 best and most unique thalis in Goa. The only catch is, none of them has fish! In a sea of predominantly vegetarian restaurants, Sartaj is a blessing. Smack-dab in the middle of Panjim city on MG Road, Sartaj has been around for decades, serving up a great fish thali, along with refreshing cold drinks. But hold the sol kadi, we’re here for their chicken thali – and boy is it a treat! 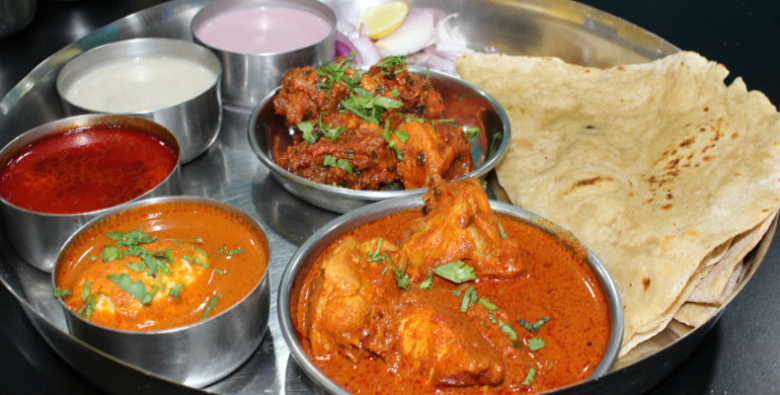 At just Rs 120, you get all the trimmings of a typical thali, but with a simple, yet mouthwatering chicken gravy. Pair it with one of the best limbu sodas in Panjim for the perfect lunch. You know it’s good if their prize dish is in the name. If you’re a fan of Maharashtrian food (or not), the Vada Kombada is something you definitely need to try in your lifetime. Fluffy, puri styled vadas made of rice flour, accompany an intensely spiced Kombada chicken curry, along with close to 10 other accompaniments. 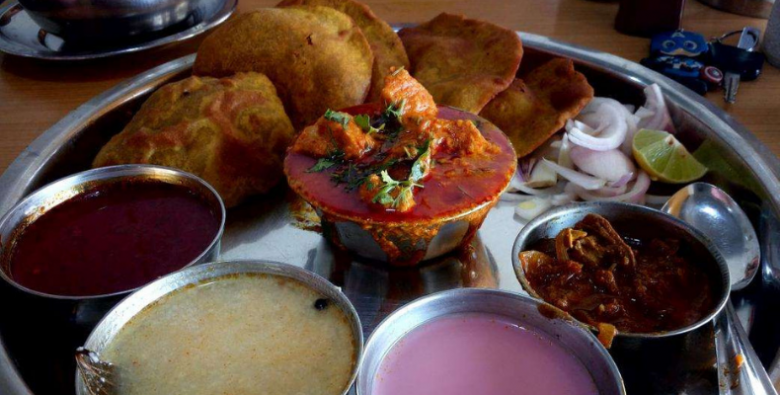 Hotel Maruti is one of the very few restaurants that serve stellar Maharashtrian cuisine. 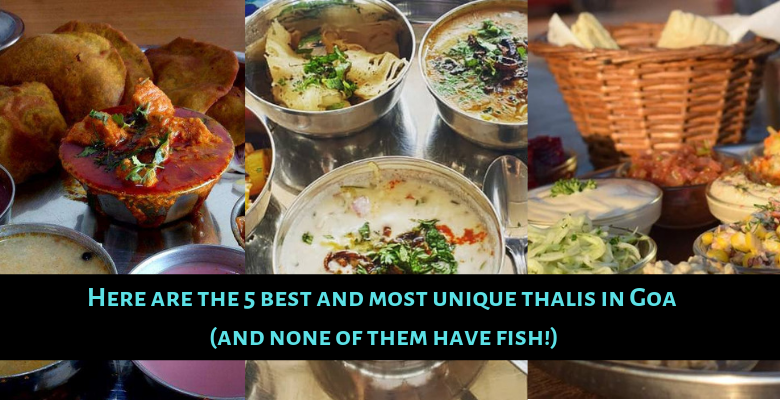 If you’re feeling less adventurous, you have 16 other thalis to choose from – no pressure. 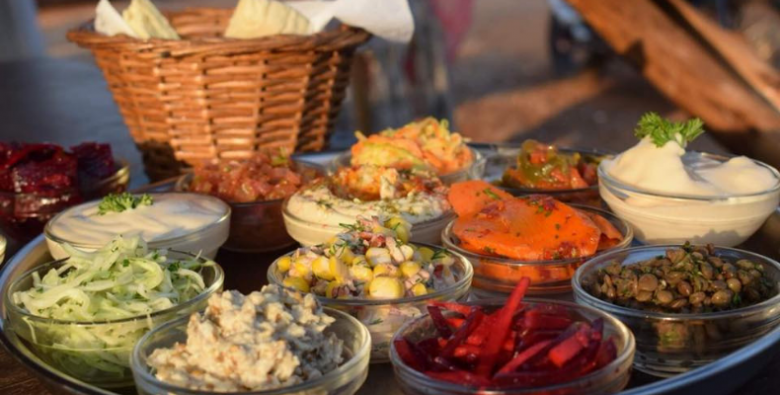 A pick from our recent list of The 5 Best Middle Eastern Restaurants in Goa, Goa’s Ark is well known in Anjuna for their Mediterranean and Israeli cuisine. The diverse menu boasts a variety of salads and mezze dishes, which makes its way into the Vegetarian Thali Mezet – which is 12 salads and a bread basket. A number of their stand-out salads form the thali, such as the Baba Ganoush, Matbuha, Beet and Carrot, and more. If you’d like a slimmed down version, you can opt for the Mini Thali Mezet which has just 6 of the 12 salads. Trust us when we tell you, this thali is fit for a king! Probably our most favourite thali on the list, the Chocolate Thali at La Plage is just sinful. Delightfully sinful. 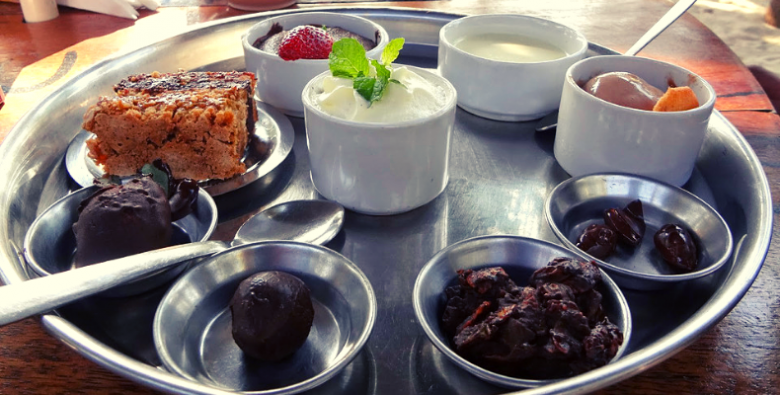 Picture everything that is good in life, and that’s pretty much what the Chocolate Thali is. Chocolate mousse, chocolate cake, a chocolate rum ball, strawberries dipped in chocolate, and the list goes on. This plate of desire boasts over half a dozen chocolate inspired wonders which is the perfect end to a night of fine French dining. The thaal at Thaal is definitely something you need to try at least once in your life. 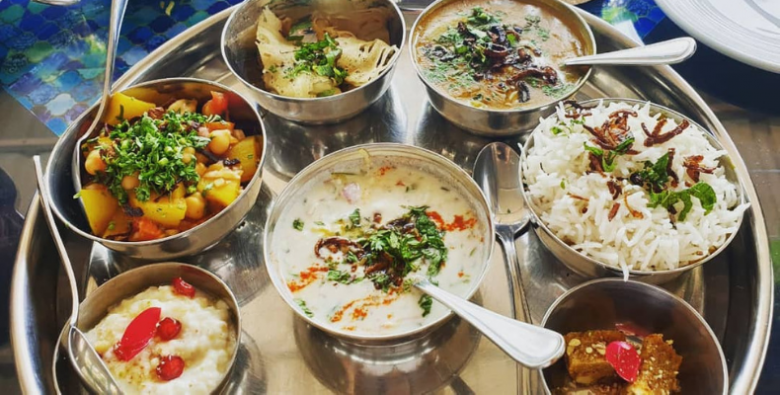 The experience of eating Bhora cuisine the real way – the family way, is something that Thaal takes very seriously. The thaal boasts 7 to 8 different veg and non-veg (read mutton) dishes, served in a plate so big, it requires a minimum of four or a maximum of eight people to partake. Mutton samosas, Phirni, Salad, a different mutton based main course each day, including biryani on Sundays – it’s all part of the Bohra experience. 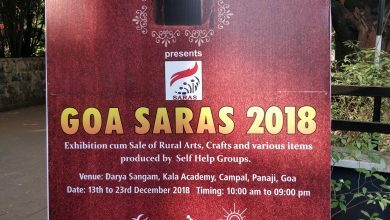 If you’re looking to try something different in Goa, a visit to Thaal sure is one for the books. Which one of these unconventional thalis are you going to try on your next night out? Is it the Chocolate Thali? We’re not judging. Just let us know what you thought of it in the comments below.